When I say surf more – I mean go to the beach more, and whenever you go to the beach you take your camera right? so you will end up shooting more surf photo’s too. 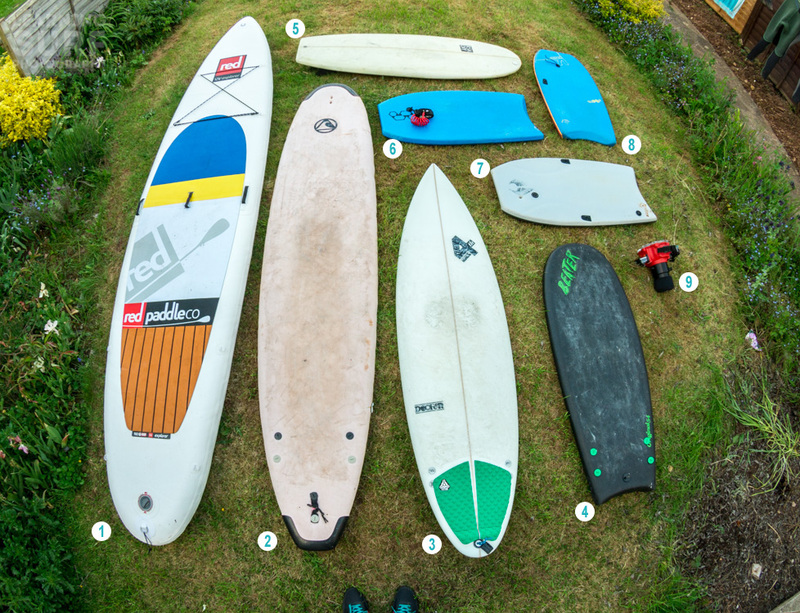 Basically I just wanted to get a photo of my boards all laid out, and this post is the excuse to do that, future parts of the How To Surf More series will offer more practical insights into surfing more and better waves, this one’s mostly for me. Since moving house about 3 years ago, and having my very own garage for the first time, I’ve accumulated a few boards. The idea is to have the most chance of getting in the water on any given day, and making the most of the conditions when you’re in. 12′ 6″ Red Paddle Co Explorer – an inflatable SUP, it fits in a backpack and inflates in a few minutes, the length allows you to cruise fairly easily on flat water but I wouldn’t want to surf on it, it should offer a nice platform for photography too. 9′ Surface softboard – great fun in small summer waves, I picked it up second hand from Discovery Surf School so it’s in a well loved condition. 6’8″ Fourth Doofer – I’m quite a big guy, 6’2″ and about 90kg, I don’t ride a stand-up too much, in this size the Doofer’s got loads of volume and still turns easily. 4’6″ Catch Surf Beater – I put in my own twin fins, a good fun softboard for shorebreaks, it’s got loads of float for such a short board. 5’3″ Home Shaped Mini Simmons – this thing is massively wide and thick and fun to surf in crappy waves, it goes nice in a straight line but I can’t duck dive or turn it very well so it’s not ideal for the majority of conditions, making it was a great experience though, and it was perfect for a standing river wave too. 42″ Science MS1 – this has a 3D core, somewhere between PE and PP, so it goes pretty well in cool UK water. 42″ NMD Dave Winchester – My travel board, it’s got a PP core and a stringer so it’s good for hot water, I’ve also added FCS softboard plugs for mounting a GoPro into on both rails and near the nose, so I’ve got most angles covered. 42″ Division 71 Deluxe – It’s got a PE core with 2 stringers and plenty of dings and bumps, it’s been my main board for a while, I mostly use it when I’m surfing hollow right handers. Aquatech CR-60 housing – I include this because I treat it like another board, there are times I go to the beach and it’s small but clean and it’s barely worth bodyboarding but it’s awesome fun to take photo’s (that’s my new 70-200mm port on the housing by the way). I think I could cut this down to four boards and the housing really, one bodyboard obviously, for the hollow days, the SUP for when there’s no waves, a big softboard or longboard for small clean days and an all-round stand-up for onshore or fat days, but the others give me more options, and more options means more time in the sea. The main take-away from this post (other than me having too many boards in my garage) is that a housing is truly an alternative to a board, just as valid as any of the others, there are days when it is hands down the best option out of the lot (crowded days especially), I get to be in the water and enjoying the waves as much as if I was riding any of the others. It seems like a huge investment when you’re starting out in surf photography, but a water housing will open up so many more opportunities to get more out of the sea, so if you were thinking about a new surfboard, consider looking into a housing, or a new port, or lens instead, if you’re like me you’ll get just as much out of it (and it’ll probably last longer too).